Did you know 45% of small businesses don’t have a website? Although word-of-mouth still stands as an effective marketing strategy to get new customers, businesses without a website miss out on more potential leads—and sales. TNTMAX is at the center of the Bergen County web design revolution – here to help good businesses become great! But, if you think having a great website is just about picking the right colors, fonts and images to show off your business, think again. Even businesses with websites can benefit from design upgrades, as your website is one of the most influential representations of your business reputation and brand. How your website is designed can convert first-time visitors and secure repeat customers. In today’s digital marketing climate, your website should serve as a hub for bringing in new leads, drip-marketing campaigns, converting visitors to buyers through email marketing, automated touchpoints to keep buyers coming back, and fostering a community around your brand. You can accomplish all of that and more by utilizing the full scope of services from TNTMAX: not just a Bergen County web design company, but a one-stop shop for all of your digital marketing needs. Your business is unique, and it deserves a website that showcases its services and individuality. Here’s why TNTMAX is your number one choice for custom websites, packed with the digital marketing tools your business needs to reach #1 in its industry. Here at TNTMAX, we know that at the heart of every great business is the team. Your team members are the unsung heroes that make the difference between your company staying in the start-up stand and achieving Fortune 500 status. TNTMAX brings a level of expertise to Bergen County web design that is supreme. For over two decades, our team has been helping business owners with their web and tech needs from every angle. We believe entrepreneurs should take their company to new heights in sales and service, not struggling with DIY design sinkholes. No matter what your company needs from its website, TNTMAX offers a perfect solution. Our team can take your entrepreneurial dream from a scribble on a napkin to a stunning website and online marketing masterpiece. 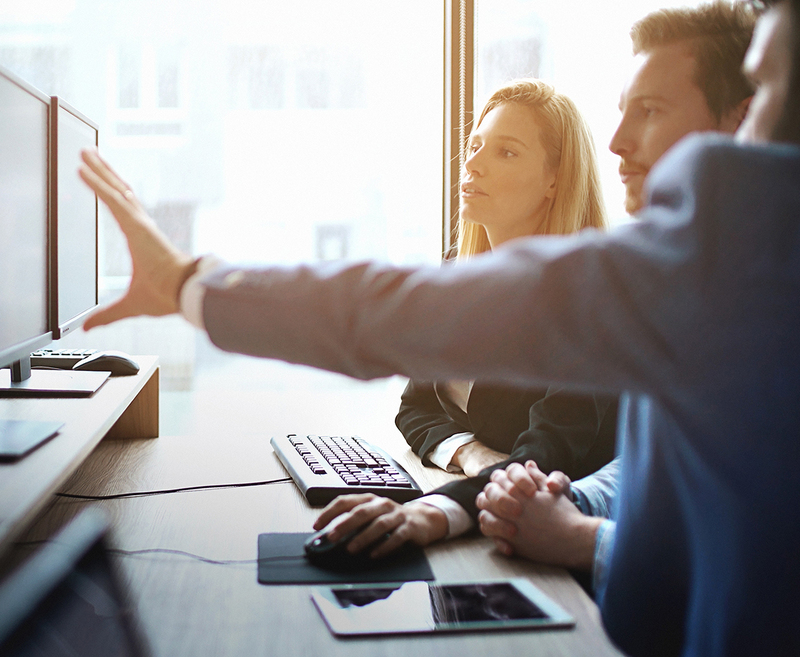 Our mission is simple; we want you to know we’re here to be the long-term solution for the entire evolution of your business. That’s why our team is comprised of a variety of tech specialists to work together toward a common goal. Our team can help with every aspect of your business’s online needs. We cover everything from basic services like hosting to building your company a website from scratch with engaging, original content. 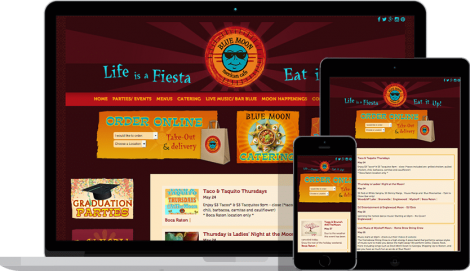 Your website doesn’t have to be a static digital business card. With custom web design and content management tools from TNTMAX, your website becomes a hub of community among your clients and providers. Our web designers can provide you with effective tactical strategies that best meet your business goals. In addition to web design, our company handles a variety of IT services that can ensure your company’s online safety and the safety of those who visit your site. TNTMAX assesses your company’s cyber vulnerabilities and creates a customized cyber defense plan that protects valuable website data and company assets from malicious hackers. If your site includes e-commerce, we can work to keep your shopping portals and customers’ personal payment information safe. If your site intends to build community by utilizing members areas or forums, a strong cybersecurity system is important to protect your site from phishing scams and viruses. Or, if your team utilizes your website as a workflow hub through cloud-based staff portals, keeping your valuable work data protected from hackers is key. We’ll get to know your brand, get an in-depth look at your current needs and future aspirations. From there, we’ll develop a strategic web marketing plan that grows with your company. Our programs are designed to be cost-effective while still addressing areas of potential growth through fostering a significant digital community. A website’s content management system, or CMS, refers to the back-end management of your site’s entire library of text and graphics. Having efficient CMS tools is especially important when it comes to regularly-updated content such as events and blogs. At TNTMAX in Bergen County, our web design experts can develop a custom CMS for your company, allowing for an intuitive interface for your back-end site management. A custom CMS allows for design continuity that perfectly reflects your brand, as well as flexibility for your site to grow with your company. By creating various design components that can be easily added, edited or removed, your website management becomes significantly more flexible and scalable than a traditional, static site. WordPress is perhaps the most well-known example of a content management system. However, depending on the nature of your business or the digital marketing strategy you envision, there are other CMS tools that TNTMAX can integrate with your website. 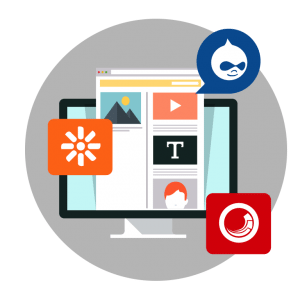 Drupal, Kentico, and Sitecore, for example, are other content management systems that might better complement your company’s digital marketing. From our office. TNTMAX provides businesses in Bergen County & Essex County web services & custom website development utilizing WordPress, Drupal, Kentico, & Sitecore. Learn more about each CMS tool in detail here to get an overview of how each can integrate with your business goals. We make an app (or program) for that! Our talented team can build more than just an excellent program for your company; we can design custom apps too. Set your company apart from the rest with an app from TNTMAX that sets a higher standard for customer service. We can integrate one of several options with your website to boost engagement, such as e-Commerce, Time-Tracking, Analytics, Big Data, Artificial Intelligence and more. Over the last two decades, we’ve perfected helping business your like yours retain customers and have faster turnaround times. Our dedicated team of professionals is ready to show you how they can lower your expenses and increase your company’s value. If your website isn’t converting first-time visitors to frequent buyers, talk to us about custom digital marketing strategies. From the moment they visit your site, your brand should stand out, and your design should be easy to navigate. Your business is unique, and it deserves a website that showcases its individuality. With TNTMAX’s Bergen County web design services, we can make your Garden State or Empire State business shine nationally – and beyond! Let our brilliant team of web designers that shows your brand and makes buying from you simple. When paired with our other services, your company will have a website that can scale with your business and has robust security. Whether searching from a desktop or phone, finding your business will no longer be a problem for potential customers. Our skillful use of SEO can take your website from oblivious to obvious among the top search results. With responsive web design and support for all your plug-ins, your website is sure to increase your bottom line and online exposure. Our portfolio is bursting with sites we’ve designed; each is a masterful blend of cutting-edge technology and personalized branding. Contact TNTMAX today, and you’ll see why we’re the trusted name in Bergen County web design for keeping you one step ahead of your competition! Online marketing is more than just having a presence; you need a plan. At TNTMAX, we specialize in marketing strategy that delivers results. Our team is constantly keeping up to date on the latest in keyword research and SEO strategies to maximize your ROI. As the search engine algorithm changes, so will our approach. Long-lasting lead generating results take time, and our team isn’t afraid to put the work it takes to get you consistent traffic. We’ll change your plan as needed to optimize your results for lasting success. With our team of SEO experts, your site will be customized to include short-tail, long-tail, and local keywords. High search engine rankings require more than just a clever keyword – that’s why we incorporate back-linking and high-quality content too. Our online marketing team creates content precisely aimed at your target market from every aspect. Every potential customer is valuable, and we want to make sure they all find your site. By utilizing our expertise, you’re increasing the creditably within your industry to your prospective customers. When it comes to being a long-term success, nothing speaks louder than your reputation. After over twenty years of providing IT solutions to our clients, we know about building trust. Our team can help solidify your company as a name that can be trusted too. As we march into 2019, join us in the revolution to help businesses like yours start the New Year off stress-free and with big dreams. We’ll help you save money, save time and set the bar for customer service in your industry. There’s no need to start a new year dealing with old problems. At TNTMAX, we specialize in being your technology solution. Looking for a Bergen County website design company to overhaul your business’s site? TNTMAX can transform your site into a complete digital marketing hub for your Garden State business. Our headquarters is located in Wyckoff, New Jersey, though we serve surrounding areas: Rockland County – Manhattan & Brooklyn; Bergen County – Wyckoff, Paramus, Hackensack, Newark, and Garfield to name a few. Not in this service area? Contact us to find out how TNTMAX can work remotely for your business!